Made with heavy duty professional quality pressure cast aluminum will not wrap and conduct heat evenly. Healthy Legend's Commercial Cookware Professional Ceramic Coating cookware set features clean, elegant lines for a most unique cookware design. It comes with the best ceramic non-stick coating from the German Weiburger Greblon. Scanpan Professional is made from a core of solid squeeze-cast aluminum, forged into shape with 250 tons of pressure. The optimum thickness of the pan base prevents warping and keeps the pan base perfectly flat, especially important when used with glass top or ceramic ranges. The patented ceramic nonstick surface from Germany is best answer to the widely known health and cancer hazard from using all traditional PFOA based non-stick surface. Almost all the non-stick cookware in department stores now are traditional PFOA based coating including the very expensive ones. Healthy Legned's Commercial Cookware professional cookware is safe to use with metal utensils because the coating is much harder than Teflon. However, you should still use the non-stick cooking utensils on the save side. The only way you can damage the coating is to hit it hard with a metal utensil. It cannot scratch off easily but it can chip off like any ceramic. Why is Healthy Legend cookware Environmentally Friendly? This cookware set has always been PFOA and PTFE free. With their German Weiburger Greblon ceramic coating, there is no PFOA used at any stage of the entire process, resulting in a "clean and green" nonstick surface from a smooth ceramic finish. The performance of the ceramic cooking surface is not different in any way from the performance of PFOA based surface. The only difference is such ceramic coating color or gray. 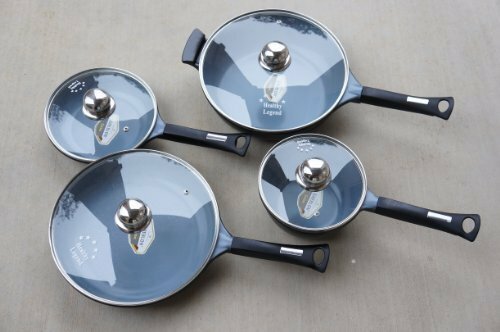 I had replaced all my traditional non-stick coating cookwares with the Healthy Legend cookware. The included high quality glass lid is break resistance. Built-in iron disc for use on the ultra efficient induction cooktops. New Design and Induction Cooktop Ready! Lead and Chromium Free. This cookware set is coated with a non-toxic and really tough lead free ceramic coating. Non-metallic cooking pure ceramic cooking surface reduce the change of darkening of food due to excessive high heat. The coating protect food from sticking and reduce the possibility of food blackening (also can cause cancer according to health professionals). Coated with the best German Weilburger Greblon Ceramic nonstick finish. This coating is the best of best and 10 times more durable than Teflon and even better than ceramic-titanium. Set consist of a 11.2" (28cm) fry pan, 11.2" (28cm) sauce pan, 8" (20cm) small fry pan, and a 1.6 Qt. sauce pan. Each comes with a temper proof glass lid. If you have any questions about this product by Commercial Cookware / Healthy Legend, contact us by completing and submitting the form below. If you are looking for a specif part number, please include it with your message. Scanpan Pro S5 Saucepan 63231800 , 2 qt.